All photos that follow are courtesy of the companies quoted. The first question that the Mark IV Builders website advises homeowners to ask before hiring any contractor is “Are you licensed?” Yet it’s clear that this Maryland-based company’s owner, Mark Scott, a builder-turned-remodeler with 35 years of experience, has lost faith in the value of a license as a credential. “While the intent [of a license] is to protect the homeowner, the reality is nowhere near that,” Scott says. He believes licensing has little influence on homeowners in a state where 5,000 licensed contractors, he says, capture only about 40 percent of the available work. Unlicensed contractors operate in virtually every nook and cranny of America. In California alone, as many as 70,000 contractors are working illegally, compared with 284,210 licensed contractors (including retirees), according to Rick Lopes, a spokesman for the California Contractors State License Board (CSLB), in Sacramento. Licensed remodelers typically attribute this persistent swarm to the industry’s low barrier to entry and the general unwillingness or inability of municipal and state authorities to vigorously enforce their own regulations. That is, where those regs exist. In 19 states, residential contractors are either not required to be licensed or must only register with the towns they work in, usually for tax purposes. Texas has no requirements at all. “The joke in Texas is that if you have a hammer and a pickup truck, you’re a contractor,” says Angela Crane, owner of Contractor's Licensing Service, in Albuquerque, N.M., which for 26 years has been helping contractors nationwide get licensed. Where it’s mandated, licensing typically involves a decentralized and inconsistent process of checking an applicant’s financial records, insurance, experience, and background that is administered and policed by contractor boards, business and economic regulatory agencies, consumer affairs departments, or attorneys general offices, depending on the location. The problem is compounded by homeowners, many of whom turn a blind eye to the question of licensing when selecting a contractor and focus instead on getting a lower price. That puts licensed contractors at a disadvantage because maintaining a license is not without cost. In addition to the fees and expenses associated with continuing education, many jurisdictions require licensed contractors to be incorporated and to carry insurance, or to put up a substantial bond or contribute to a consumer protection fund, all of which increase overhead and result in higher prices. And even a license is no guarantee that a contractor is competent. Many remodelers contend that licensing requirements in their markets are far too lenient, with exams that focus too much on legal minutiae and don’t verify whether the applicant can manage a company or adeptly execute a trade. “Licensing is a pretty low bar” for measuring a contractor’s skill level or business acumen, observes Bill Millholland, executive vice president for Case Design, in Bethesda, Md. And, given that only a handful of states require continuing education for license renewal, assessing how well contractors are maintaining their skills and knowledge can be problematic. You don’t have to look very far to corroborate these claims. For example, in May of 2016, the Nevada State Contractors Board awarded nearly $160,000 to 12 homeowners whose properties were damaged by licensed contractors. The money came from the state’s Residential Recovery Fund, which was established in 1999 to protect homeowners who have hired pros for any kind of construction, remodeling, repair, or improvement. According to the National Association of State Contractors Licensing Agencies (NASCLA), at least 11 states have such recovery funds, most of which are bankrolled in part by bonds put up by licensed contractors. So if enforcement poses little risk to unlicensed contractors, and if a license doesn’t validate competence, “What’s the incentive for homeowners to pay more for a licensed contractor?” asks Mark IV’s Scott. Most remodelers reflexively oppose reform that smacks of more regulation. So what could be done to improve the process and make a contractor’s license more meaningful to homeowners and pros alike? And in places where licensing isn’t mandated, how do professionals who do quality work get off the low-price merry-go-round and receive full value for their services? 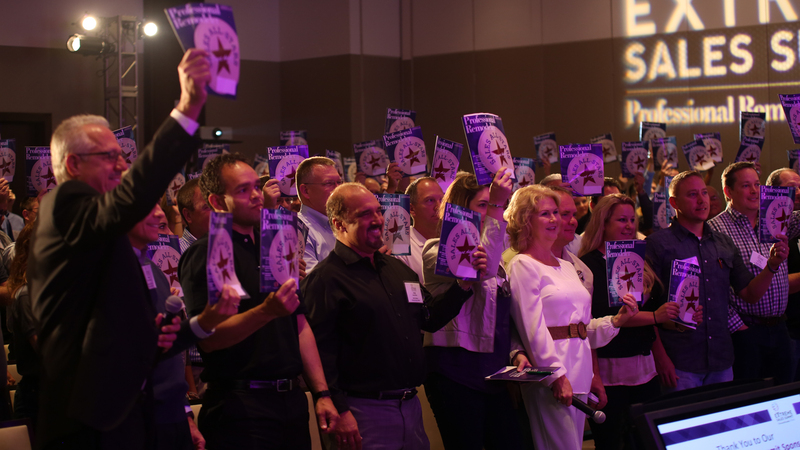 Based on insights from remodelers, officials from contractor boards, and trade groups, here are five places to start the process of reform. 1] Standardize the licensing process. To an outside observer, licensing criteria can seem arbitrary. In some states, for example, remodelers need to be licensed but home builders don’t. California has 40-plus license classifications but doesn’t require a license for jobs costing less than $500; in other states, the threshold is $1,000. Similarly, Alure Home Improvements, in East Meadow, N.Y., one of the industry’s largest full-service remodelers, is licensed in five New York counties, plus New York City and New Jersey. Its president, Sal Ferro, decries the legions of unlicensed and skill-challenged contractors that he sees operating with virtual impunity in his markets. Bringing some uniformity to the licensing process, even on a regional basis, could be a posi- tive first step toward reforming the system. Ferro thinks one solution would be the introduction of two tiers of licensing: one for general contractors who work directly with the public, which would require documented evidence of experience, financial investment, and detailed background checks; the other for subcontractors, which would require them to have health and vehicle insurance. Ferro sees the latter tier as a “pathway” for fledgling pros and immigrant labor to enter the business legally and work their way up to a GC license organically. 2] Put teeth into enforcement. The underground home repair and remodeling economy resembles a floating craps game, with unscrupulous—and sometimes undocumented—contractors operating under various names and addresses and keeping one step ahead of an underfunded enforcement community. CSLB has 200 employees tasked with investigating 20,000 contractor-related complaints per year. It made some headway in an April sting operation in six cities that nabbed 83 people for operating without a license, 21 in Bakersfield alone. But there is much more work to be done. In addition to a real commitment to manpower and funding, enforcement must include a concerted effort to educate homeowners about current licensing regulations. For example, the Nevada State Contractors Board conducts an ongoing Unlicensed Contractor Awareness Campaign, which enlists licensed contractors to educate the public and police about their industry. “They are our eyes and ears on the ground,” says Margi Grein, the Board’s executive officer. The Board annually receives between 1,600 and 2,000 complaints and investigates every one of them, she says. Nevada revoked 200 licenses last year. Legitimate contractors can also help their own cause. 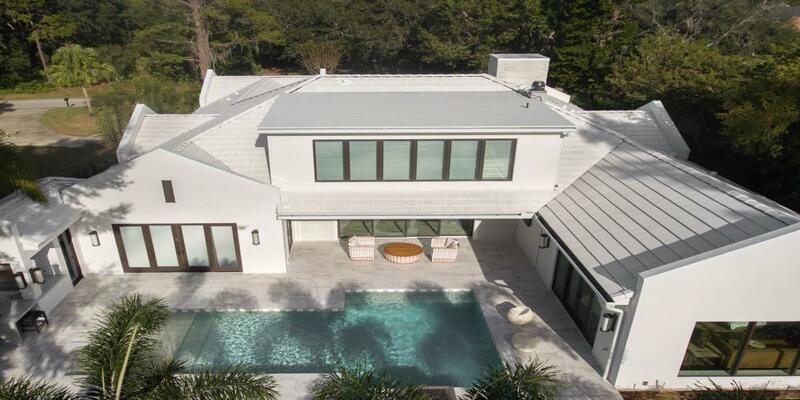 For example, in a small Florida community called Indian River Shores, one of the Florida markets where Vero Beach–based Croom Construction operates, one building official does a surprisingly good job of keeping up with rogue actors, with the help of licensed contrac- tors. “People there don’t hesitate to call the officer if they see something that looks funny,” says Charles Croom, vice president of his family’s business. But whistle-blowing contractors need some reason- able assurance that authorities aren’t turning a blind eye to unlawful conduct and will take appropriate action when it’s uncovered. Otherwise those authorities will never get the kind of industry cooperation they need to minimize illegal activities. Licensed contractors would also like their states to follow Florida’s lead in requiring proof of license to pull a permit. Allowing homeowners to pull permits, as many states do, makes it all too easy for unlicensed contractors to slip by unnoticed. Some pros think that more severe measures, such as fines, would get homeowners’ attention. 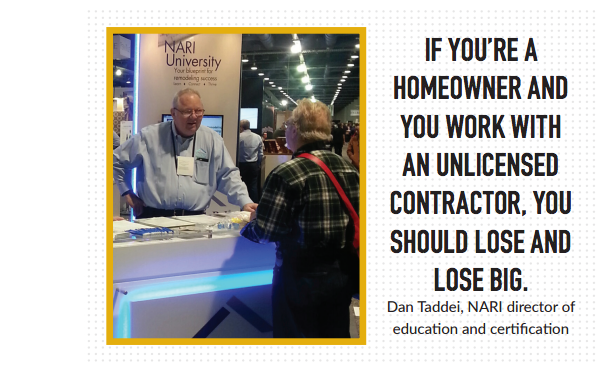 “If you’re a homeowner and you work with an unlicensed contractor, you should lose and lose big,” says Dan Taddei, director of education and certification for the National Association of the Remodeling Industry (NARI). 3] Test for skills and experience. McCutcheon took the test for his contractor’s license decades ago and recalls the questions being “total nonsense” because they had little to do with real-world situations. Ferro remembers studying a pamphlet on the way to the testing center and completing the exam in about 15 minutes. Fast forward to 2016, and many contractors still have a low opinion of license exams that they say don’t measure whether the applicant is competent or has the know-how to run a company or to remodel a home. Crane, of Contractor Licensing Services, goes so far as to state that some tests are designed “to trick people, with random questions out of random books,” instead of devising questions about the latest building codes that touch on everyday knowledge. Some contractors also suspect—and Crane corroborates—that a state or municipal testing requirement is really just a way to generate revenue from prep courses, the completion of which, in many cases, exempts the applicant from having to sit for the actual exam. Testing is more rigorous in certain states. Applicants for a Division I (i.e., general contractor) license in Florida, for example, must submit to exams that test their knowledge of business and finance, contract administration, and project management. Applicants for Division II (i.e., specialty contractor) licenses are tested on their knowledge of business and finance and of their specific trade. Nevada requires license applicants to take two exams: one for construction management that focuses on business and law; the other for trade knowledge, which Grein concedes tests “minimum standards” of competence. Since 2009, NASCLA has offered a license exam for Commercial General Building contractors, and recently sent an request for proposal to testing agencies to develop national exams for several electrical contractor license classifications that the association intends to offer in 2017. “NASCLA was founded on the premise of states having reciprocity agreements,” Whitaker says. Five of her group’s members administer NASCLA’s exams, and Contractor Boards in 14 states (including, most recently, Oregon) and the Virgin Islands accept the exam for commercial GCs. 4] Make continuing education mandatory for license renewal. Seventeen states require some form of continuing education for license renewal, according to NASCLA. In Michigan, pros with fewer than six years of experi- ence must take 21 hours of coursework in every three- year renewal cycle. (More seasoned pros take three course hours per cycle.) Minnesota requires seven hours every year. Not everyone favors mandated continuing education. But without some formal training, “you become a dinosaur,” says Millholland of Case Design. He believes contractors, like architects and other profes- sionals, should be required to take courses to maintain their credentials. Weinberg would favor mandatory continuing education “if it were consistently applied,” he says. 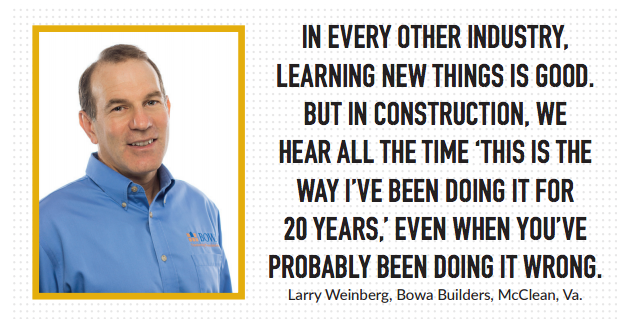 Meanwhile, Bowa Builders, like other successful remodeling companies, does a lot of training internally. For instance, every month its project managers meet to discuss design best practices. The company also brings in outside experts to talk about topics such as air sealing and insulation techniques, and every 18 months or so, Bowa holds a meeting for its employees to review building code changes. 5] Emphasize value with customers. 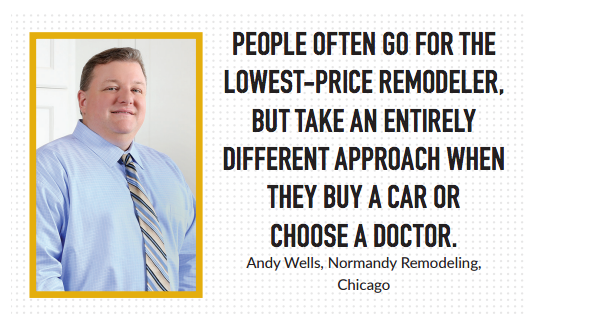 A certain percentage of homeowners have no qualms about having remodeling work done without pulling permits, says Andy Wells, president of Normandy Remodeling, in Hinsdale, Ill., a state that doesn’t require contractors to be licensed. Wells is skeptical that licensing contrac- tors would change the playing field much. To compete, Normandy trains its salespeople to emphasize to homeowners the value of working with a remodeling company that’s been around for 37 years and does about 220 projects annually with an average price tag of $118,000. Regardless of what remodelers think about the merits of licensing, they are in agreement that the industry does a mediocre job selling the bona fide strengths of licensing. That leaves them vulnerable to low-ball competitors that capitalize on home- owners’ “price first” inclinations. Scott, of Mark IV Builders, says that his company has been spending more on marketing lately, but he’s not sure it’s working because the industry “has allowed itself to be differentiated on price alone.” Reversing that trend would take a consid- erable industrywide rebranding effort, which isn’t likely to happen any time soon. Meanwhile, individual remodelers are getting their messages across to customers in different ways. “We emphasize the professional rather than the licensed part of our business,” says Millholland, of Case Design, whose home-improvement/repair division, known as Fred, does “thousands” of smaller jobs annually and bangs heads with unlicensed contractors all the time. “If you’re losing business to an unlicensed contractor, you need to look at what’s lacking in your own business.” Millholland and other remodelers believe that homeowners are much more impressed with the depth of a company’s background checks than they are about whether installers are licensed, which is vague to most customers. KraftMaster Renovations edits its prospects by who is and isn’t seeking the lowest price. “I don’t give estimates up front,” Gockeler says. “Our job is to design the home within the homeowners’ budget. Anyone who gives a price without evaluating the job first is misleading the consumer.” Contributing editor John Caulfield writes about issues affecting the new-construction, exterior-replacement, and remodeling industries. Contributing editor John Caulfield writes about issues affecting the new-construction, exterior-replacement, and remodeling industries. He is a senior editor with Professional Remodeler's sister publication Building Design + Construction. Florida is probably one of the most regulated States in the Union, even so, we too have problems with unlicensed work. A contractor's license in the State allows the builder to be in "contract" with a homeowner, to do work on their home. Other than an attorney, they are the only people allowed to write contracts and only for building and real estate the license covers. With that license, the contractor can lein the home, if not paid for the work. A contract written by an unlicensed individual will not hold up in State court, in fact evidence of the contract is punishable by a $1,000.00 fine. Standardized licensing, enforcement, testing & continuing education have been with us here for decades but again, we still have issues with unlicensed work. Interestingly and quite unintentionally, we've gained a new ally. It seems Homeowner Insurance companies are refusing to pay for damages, to unpermitted and unlicensed work. Nothing the building community has ever said or done has grabbed the attention of homeowner's faster, including telling the homeowner that they don't have to pay for the work. I am not a remodeler. I run a company in Texas that does commercial and retail interior woodwork. Some people call that millwork. Licensing creates a closed market. I've gone into other states at the request of long standing customers to install our products in bank and health care facilities primarily, and because of licensing laws have been forced to hire local, licensed carpenters. In every single case that effort has proved to be disastrous. The fact that one MUST have a license limits the competition and available work force and allows the licensed contractors to control the job sites when they have no business even being on a job site. I have multiple stories and will not do business in a state where we cannot take our own hard working talented skilled people. I discussed this with a Texas contractor who had turned the tables on this situation. They went through a long and tedious process to acquire a license in another state to perform carpentry work, then raised their pricing quite steeply and were covered up with projects. He said he can name his price and control the schedule in that state because there are not enough licensed people, while there is plenty of qualified labor, and much of what he does is clean up work behind other licensed contractors who either can't or don't finish their contracts, but who stay busy because they have a license. We work all over Texas and have various free lance crews at different price points and skill levels. We use the one with the best fit for those two criteria and seldom have any issues unless they are created by our customer (changes, poor project management, etc). It's always buyer beware, but the consumer, either residential or commercial, who hires someone they know nothing about typically gets the results they ask for, whether they realize it or not. MD Berry's response above shows just how important licensing is for our profession. It's minimum requirement that helps raise the barrier to entry, if only slightly. It isn't a guarantee of amazing work, but through permitting, at least it forces someone to be responsible for liability on a project. Not all regulation is bad and having a barrier that keeps money local and holds at least a minimum degree of responsibility for on-site contractors is important. Let's not join in Texas' race to the bottom.